Shame is a hell of a thing, as likely to be felt by victims as it is to be ignored by the guilty. 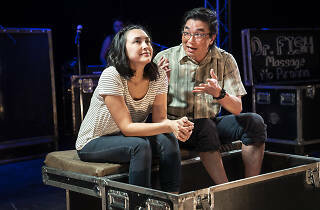 This is the notion that Lauren Yee addresses head-on in the exhilarating Cambodian Rock Band. Yee’s play is a nimble, spectacle-heavy whirligig: a detective story, a historical drama, a family comedy and a rock show with songs by the L.A. outfit Dengue Fever. Director Marti Lyons mixes and matches these disparate elements with aplomb, bringing Yee’s insightful, puckishly theatrical voice to the front of the mix. Neary (Aja Wiltshire), the American daughter of a Cambodian immigrant, has spent the past two years in Cambodia working for an NGO to prosecute the man known as Dutch: the real-life Khmer Rouge commander who oversaw Security Prison 21, which housed an estimated 20,000 prisoners with only seven known survivors. 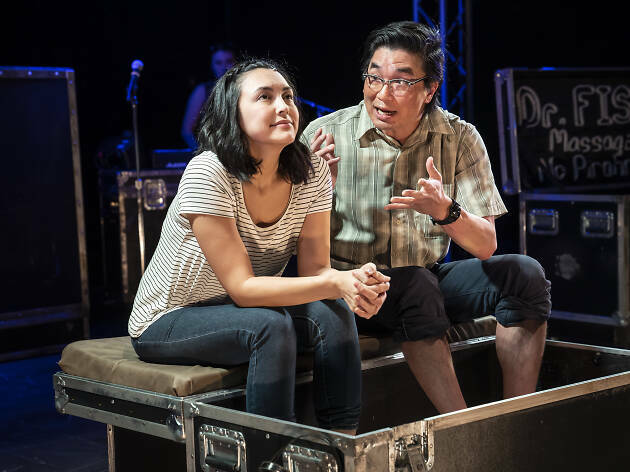 Neary’s dad, Chum (Greg Watanabe), himself a survivor of the Khmer Rouge, shows up at her hotel room unannounced in Cambodian Rock Band’s opening scene; he wants to take his daughter back to America and put the past behind them. It turns out that that Chum has a very personal connection to the S-21 case that he has kept secret for 30 years. Cut to New Year’s Eve, 1974, as Chum’s miraculous struggle for survival takes center stage. Watanabe is the play’s frontman, and his live-wire performance is the production’s greatest asset, but he is surrounded by wonderful side players. In addition to Wiltshire, the cast includes Matthew Yee in two superb turns—as Neary’s boyfriend and as the young Chum’s best friend—and a fabulous Rammel Chan, who plays the show’s devilish narrator and captures every layer of the character, from the hilarious to the horrifying. The cast also doubles as the show’s live band, knocking out tunes that encapsulate the play’s marriage of substance and style. This was the kind of music played by Chum and his friends—the sound the Khmer Rouge sought to wipe out—and there’s no way to hear it, joyful though it is, without a sense of loss. The guitars shred your heart. Victory Gardens Theater. By Lauren Yee. Directed by Marti Lyons. With Rammel Chan, Eileen Doan, Peter Sipla, Greg Watanabe, Aja Wiltshire, Matthew Yee. Running time: 2hrs. One intermission. El stop: Brown,Purple(rush hrs),Red to Fullerton. Bus:8,11,74.